Type III 65/.0100 Stranding. Nominal OD .162 inch. Maximum Continuous AMP Rating, 45 AMPS. 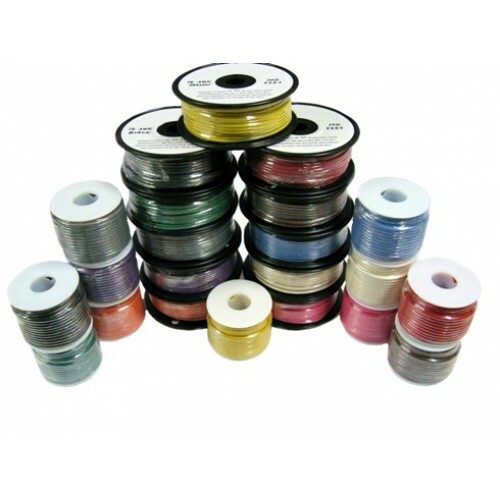 Tinned Marine primary wire available in many colors and is also very flexible, Type III stranded. Tin plated copper stranding with a jacket resistant to moisture, oil, chemicals, gasoline fuel and excellent abrasion resistance. UL 1426 Marine Grade Boat Cable. Designed to meet SAE, ABYC, UL and Coast Guard requirements, 600 volts, 105*C dry, 75*C wet. Safety standards for electrical and gasoline fuel systems CFR 33 Part 183.(BC-5W2). 1. Choose your wire color. 2. Choose a pre-determined coil/reel size.